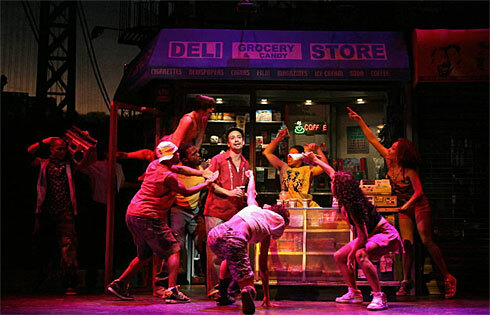 Conceived by Lin-Manuel Miranda, 28, who also wrote the music and lyrics and stars in it, the show focuses on a group of Latin Americans living and struggling in Manhattan’s Washington Heights and features a score that blends Latin, pop and hip-hop textures. Most of the characters are young, and some of them rap. If you’re thinking an uptown Rent or an updated West Side Story, think again. Heights already has been cited alongside two other off-Broadway transfers, last season’s multiple Tony Award winner Spring Awakening and this year’s superb Passing Strange, as evidence of a more progressive and culturally eclectic spirit in musical theater. But for all its youthful energy, Heights is ultimately a sentimental journey, and a safe one. True, its outcome is less predictable or hokey than the too-neatly constructed first act would suggest, but Quiara Alegria Hudes’ book is no more clever or daring than that of your average Disney screen adaptation. That is almost all that needs to be said about Showtime’s new series about an undercover F.B.I. agent who infiltrates an Islamic fundamentalist cell plotting a bioterrorist attack in Los Angeles. Se esperan importantes invitados a esta especial cita para México, ya que es la primera vez que una cinta norteamericana tiene su estreno mundial en el norte del país. Estará presente el Sr. Carlos Bremer (productor ejecutivo), quien ha promocionado y apoyado esta cinta de forma invaluable.